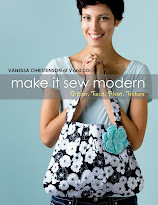 I was beyond thrilled when Vanessa asked me to share a tutorial. Though it did shake me up a bit as to what to make (the queen of tutorials, asking me to share? yikes, no pressure). I've had a few ideas in my mind for awhile and when I saw the napkins I knew that I could create something for my daughter to wear. Being in the LA area, we're lucky to have mostly sunny weather throughout the year (even in February!) But I think this shirt would look cute with a long sleeve white shirt under too; a little layered effect never hurt anyone right? 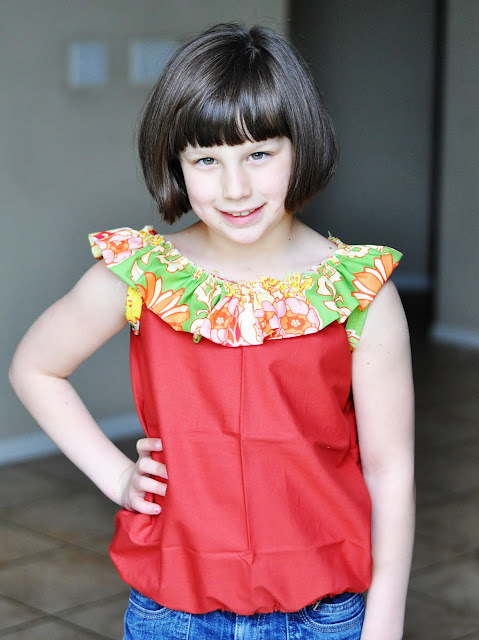 my daughter is 8 and I was able to make one ruffly shirt with the above materials. mark the armholes and neck. Cut. Sew sides together with 1/8" seam allowance. 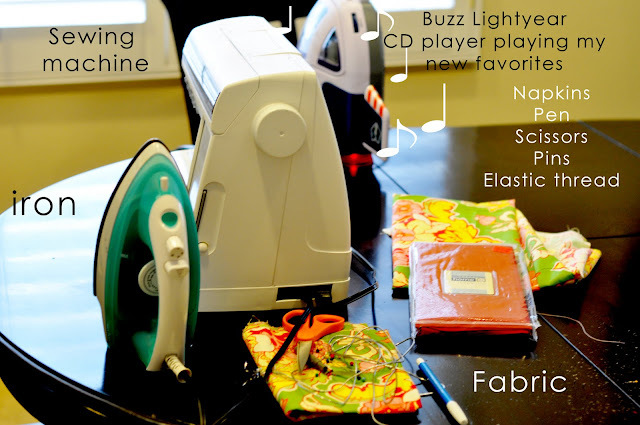 (or you can use pre-made bias tape). Pin bias tape to the arm holes and sew to attach. fold coordinating fabric in half, wrong sides together. 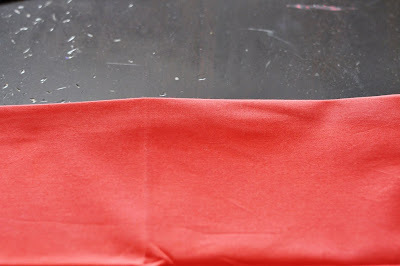 Baste along the edge to create a ruffle. Pull the thread carefully to create a ruffle. Even it out along the way. Match ends up and sew so you will have a ruffled circle now. 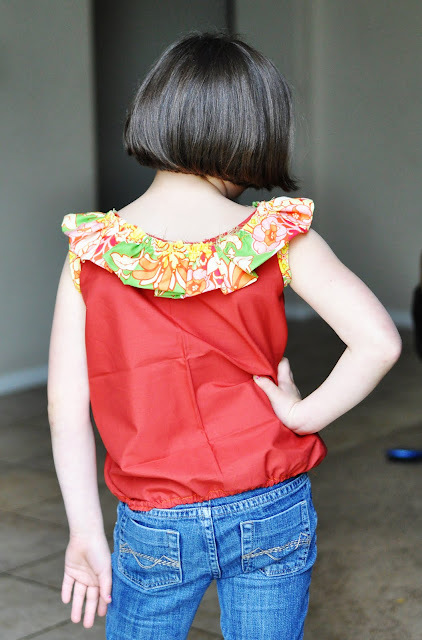 Pin the ruffle to the front of the shirt. 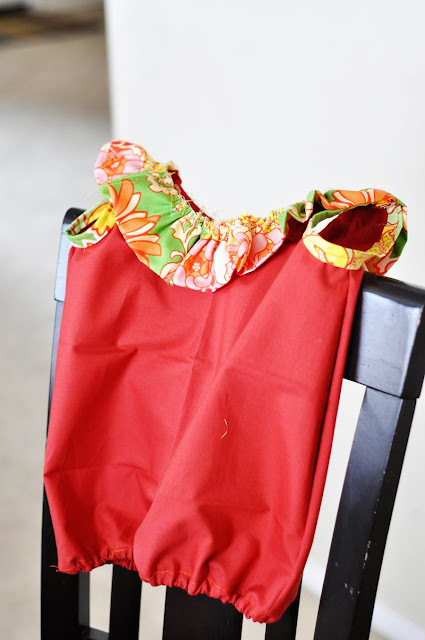 Set your stitch length back and sew to attach the ruffle. Next fold the hem under 1/2" and press. Sew a straight stitch leaving a small hole to feed elastic cording. For this shirt I used elastic cording but you could use regular elastic also. Sometimes when I can't find my darn safety pin I improvise with a paper clip. Just tie it the end and thread your elastic through the hem. then tie the ends of the elastic together. Making sure the elastic cording is tucked in, sew the final hole together. thank you so much mique! i'm so in love with this and am already thinking up of some cute combination of fabrics i want to put aside for katie's shirts! next week we have another guest blogger as well as a sponsored giveaway. fun stuff people fun stuff. v and co loves her sponsors and welcomes newbie forever you! I've been a fan of 30 days for a long time-LOVE her blog! I love her blog as well!! She always posts about the greatest stuff! What a great idea! I love the little shirt! Love it, now I will have to keep on the lookout for some good napkin deals! I am a SD native as well, and was curious what high schools you and Monique went to (I went to Mt. Carmel in Ranch Penasquitos). Love and miss it so much - beach, warm, good tacos, the works. How cute! I needed something different to make instead of embellished tshirts! Thanks! 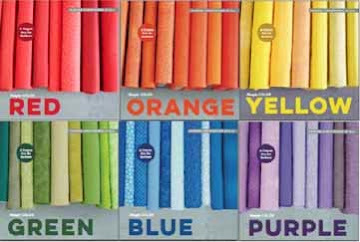 Napkins, who would have thought they could be so stinking cute as a shirt? I love it Mique! Great tutorial. fun to know more about you Mique! So cute!! Now if only I had a girl to make one for. I LOVE it! Thanks for the tutorial Mique. Thanks V! Bring on the Mexican food! Cute idea using napkins. So, is the neck ruffle an exposed raw edge? Maybe I'll try it with covering it up with another band of bias binding. Love it! Super cute. I wish there were bigger napkins out there and maybe I could try and make a grown up shirt, since I know that my boys wouldn't like wearing them. I sure love her blog. so cute!! & totally something i never would have thought of from napkins! nice job! gorgeous! i totally am in love with this i totally want to make one for me! Vanessa, I just made your fabric decorative balls from your etsy pattern. I LOVE them! Thanks for sharing your creativity! I posted about you on my blog! Very cute top! What a cleaver idea to use the napkins that were on sale. Kids out-grow clothes so fast why pay high prices. I love her cute hair cut. What is next? I love the way you are always mixing it up. Very cute! I wish my daughter was a little bigger and I'd totally make this shrit for her! Thanks for having Mique! I have this blog is in my fav list, her explanations are so clear, and the projects are great!! This is so pretty!! It make me want spring to arrive - NOW. WHERE DID YOU GET THAT BUZZ LIGHTYEAR CD PLAYER? I must have one. I love this site!! I'm adding it to my RSS right now! Thanks so much for visiting my blog as well as leaving a comment. I really appreciate it so much! !